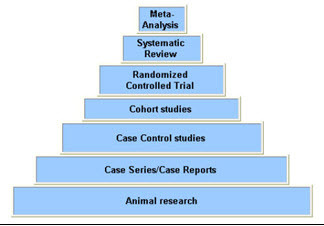 As you move up the pyramid the study designs are more rigorous and allow for less bias or systematic error that may distract you from the truth. Case series and Case reports consist of collections of reports on the treatment of individual patients or a report on a single patient. Because they are reports of cases and use no control groups to compare outcomes, they have little statistical validity. Case control studies are studies in which patients who already have a specific condition are compared with people who do not have the condition. The researcher looks back to identify factors or exposures that might be associated with the illness. They often rely on medical records and patient recall for data collection. These types of studies are often less reliable than randomized controlled trials and cohort studies because showing a statistical relationship does not mean than one factor necessarily caused the other. Cohort studies identify a group of patients who are already taking a particular treatment or have an exposure, follow them forward over time, and then compare their outcomes with a similar group that has not been affected by the treatment or exposure being studied. Cohort studies are observational and not as reliable as randomized controlled studies, since the two groups may differ in ways other than in the variable under study. Randomized controlled clinical trials are carefully planned experiments that introduce a treatment or exposure to study its effect on real patients. They include methodologies that reduce the potential for bias (randomization and blinding) and that allow for comparison between intervention groups and control (no intervention) groups. A randomized controlled trial is a planned experiment and can provide sound evidence of cause and effect. Systematic Reviews focus on a clinical topic and answer a specific question. An extensive literature search is conducted to identify studies with sound methodology. The studies are reviewed, assessed for quality, and the results summarized according to the predetermined criteria of the review question. A Meta-analysis will thoroughly examine a number of valid studies on a topic and mathematically combine the results using accepted statistical methodology to report the results as if it were one large study. Cross-sectional studies describe the relationship between diseases and other factors at one point in time in a defined population. Cross sectional studies lack any information on timing of exposure and outcome relationships and include only prevalent cases. They are often used for comparing diagnostic tests. Studies that show the efficacy of a diagnostic test are also called prospective, blind comparison to a gold standard study. This is a controlled trial that looks at patients with varying degrees of an illness and administers both diagnostic tests — the test under investigation and the “gold standard” test — to all of the patients in the study group. The sensitivity and specificity of the new test are compared to that of the gold standard to determine potential usefulness. Qualitative Research answers a wide variety of questions related to human responses to actual or potential health problems.The purpose of qualitative research is to describe, explore and explain the health-related phenomena being studied. Retrospective cohort (or historical cohort) follows the same direction of inquiry as a cohort study. Subjects begin with the presence or absence of an exposure or risk factor and are followed until the outcome of interest is observed. However, this study design uses information that has been collected in the past and kept in files or databases. Patients are identified for exposure or non-exposures and the data is followed forward to an effect or outcome of interest. 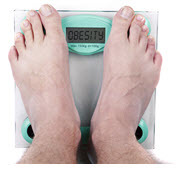 In patients with type 2 diabetes and obesity, is bariatric surgery more effective than standard medical therapy at increasing the probability of remission of diabetes? It is a therapy question and the best evidence would be a randomized controlled trial (RCT). If we found numerous RCTs, then we might want to look for a systematic review.